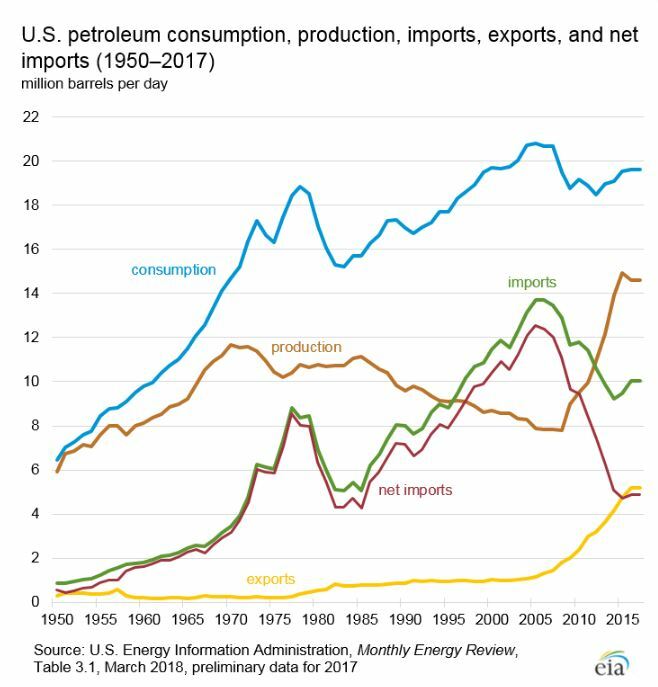 U.S. oil production is booming at record levels, and U.S. oil exports have also reached new highs — 3 million barrels a day in the last week, according to government data. Those exports are more than most OPEC countries can produce each day and only lag two OPEC countries, Saudi Arabia and Iraq, in terms of exports. Oil prices jumped after U.S. government data also showed a large drop in domestic oil inventories. The Eagle Ford crude oil tanker sails out of the the NuStar Energy dock at the Port of Corpus Christi in Corpus Christi, Texas, U.S., on Thursday, Jan. 7, 2016. U.S. oil exports reached a record 3 million barrels a day last week— a greater amount than is pumped each day by all but three OPEC countries. When combined with fuel products, like diesel and gasoline, U.S. oil and related products exports totaled 8.5 million barrels a day last week, the most ever, according to U.S. Energy Information Administration weekly data. U.S. oil production also continued at a record pace of 10.9 million barrels a day, a level first reached this month. 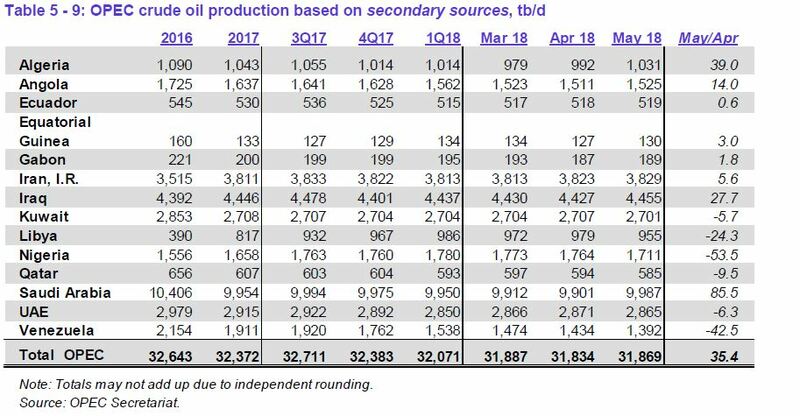 That is more oil than produced by every other country in the world, except for Russia, which does not belong to OPEC and pumps just over 11 million barrels a day. U.S. refineries also took in a record 18 million barrels of oil. To put U.S. exports in context, the U.S. was able to export more oil per day last week than most OPEC countries drilled. But of the largest producing OPEC countries, only Saudi Arabia and Iraq are exporting more oil than the U.S. did last week, according to John Kilduff, partner with Again Capital. In June, he said Saudi Arabia exported about 7.5 million barrels a day and southern Iraq exported 3.6 million. Iran exports about 2.4 million barrels a day, and the U.S. is seeking to remove those barrels from the market through sanctions. "The fact is we're loading crude oil for export across the Texas Gulf Coast. The biggest issue that exporters are facing is getting oil from the Permian basin to the Gulf Coast because of the lack of pipeline capacity," said Andrew Lipow, president of Lipow Oil Associates. The U.S. weekly exports fluctuate dramatically, but if they stay at this level, the U.S. would be just behind Canada, which sends about 3.5 million barrels to the U.S. each day, the bulk of of its exports. As U.S. production has grown, U.S. imports have decreased. The U.S. imported a relatively high 8.4 million barrels per day last week. The 3 million barrel level may not be sustainable just yet. Analysts said some of the oil appears to have been pulled from inventories, which fell an unusually large amount last week. The previous record for oil exports was 2.56 million barrels a day, a level reached in May. Oil prices rose on the report because of the large drop in inventories. West Texas Intermediate crude futures were up 3.2 percent, at $72.76. That follows Tuesday's jump of more than 3 percent on concerns U.S. efforts to sanction Iran will leave the market undersupplied. "The concern is the 2 million barrels of Iranian oil cannot be made up by the rest of the world. Those types of thoughts are filtering into the market," said Lipow.